This article is about the Atlantic hurricane of 1961. For other storms of the same name, see Tropical Storm Carla (disambiguation). Hurricane Carla ranks as the most intense U.S. tropical cyclone landfall on the Hurricane Severity Index. The third named storm and first Category 5 hurricane of the 1961 Atlantic hurricane season, Carla developed from an area of squally weather in the southwestern Caribbean Sea on September 3. Initially a tropical depression, it strengthened slowly while heading northwestward, and by September 5, the system was upgraded to Tropical Storm Carla. About 24 hours later, Carla was upgraded to a hurricane. Shortly thereafter, the storm curved northward while approaching the Yucatán Channel. Late on September 7, Carla entered the Gulf of Mexico while passing just northeast of the Yucatán Peninsula. By early on the following day, the storm became a major hurricane after reaching Category 3 intensity. Resuming its northwestward course, Carla continued intensification and on September 11, it was upgraded to a Category 5 hurricane. Later that day, Carla weakened slightly, but was still a large and intense hurricane when the storm made landfall near Port O'Connor, Texas. It weakened quickly inland and was reduced to a tropical storm on September 12. Heading generally northward, Carla transitioned into an extratropical cyclone on September 13, while centered over southern Oklahoma. Rapidly moving northeastward, Carla's remnants reached the Labrador Sea, Canada and dissipated on September 17, 1961. Satellite image of Hurricane Carla on September 10. While crossing the Yucatán Channel, the outer bands of Carla brought gusty winds and severe local flooding in western Cuba and the Yucatán Peninsula, though no damage or fatalities were reported. Although initially considered a significant threat to Florida, the storm brought only light winds and small amounts of precipitation, reaching no more than 3.15 in (80 mm). In Texas, wind gusts as high as 170 mph (280 km/h) were observed in Port Lavaca. Additionally, several tornadoes spawned in the state caused notable impacts, with the most destructive twister, an F4 near Galveston, Texas, resulting in 200 buildings severely damaged, of which at least 60 were destroyed, and 8 deaths and 55 injuries. The aforementioned tornado remains the strongest hurricane-spawned tornado ever recorded, with wind speeds in the tornado nearly 50% greater than Carla's peak intensity. Throughout the state, Carla destroyed 1,915 homes, 568 farm buildings, and 415 other buildings. Additionally, 50,723 homes, 5,620 farm buildings, and 10,487 other buildings suffered damage. There were 34 fatalities and at least $300 million (1961 USD) in losses in Texas alone. Several tornadoes also touched down in Louisiana, causing the destruction of 140 homes and 11 farms and other buildings, and major damage to 231 additional homes and 11 farm and other buildings. Minor to moderate damage was also reported to 748 homes and 75 farm and other buildings. Six deaths and $25 million in losses in Louisiana were attributed to Carla. Heavy rainfall occurred in several other states, especially in Kansas, where flash flooding severely damaged crops and drowned 5 people. Overall, Carla resulted in $325.74 million in losses and 43 fatalities. As early as September 1, a tropical disturbance – an area of convective activity – was observed tracking westward across the Caribbean Sea within the Intertropical Convergence Zone (ITCZ). Around that time, an anticyclone was situated over the western Caribbean Sea at the upper-tropospheric levels. Surface charts indicate that a low-level circulation was developing early on September 3. Thus, it is estimated that a tropical depression – a tropical cyclone with sustained winds with winds of less than 39 mph (63 km/h) – developed about 175 miles (282 km) northwest of Barranquilla, Colombia at 1200 UTC. Initially, the center of circulation remained difficult to locate on surface charts due to lack of data. At San Andrés, winds shifted west at about 12 mph (19 km/h), while barometric pressures dropped to 1,007 mbar (29.7 inHg). The Weather Bureau Office in Miami, Florida issued its first bulletin at 1600 UTC on September 4, while the depression was centered about 250 miles (400 km) east-southeast of Cabo Gracias a Dios, Nicaragua. It is estimated that sustained winds reached 45 mph (75 km/h) at 1200 UTC on September 5, thus the depression strengthened into a tropical storm and was named Carla, while located just northeast of Cabo Gracias a Dios. A reconnaissance aircraft flight reported that Carla was continuing to intensify, with surface winds of 50 mph (85 km/h). Radars reported an unusually large tropical cyclone, with convective bands extending about 520 miles (840 km) outward from the center. Around 0000 UTC on September 6, Carla passed near Swan Island, which reported a barometric pressure of about 995 mbar (29.4 inHg) and wind gusts of 60 mph (95 km/h) from the southwest. Based on observations obtained by a reconnaissance aircraft at 1100 UTC on September 6 – namely a barometric pressure of 982 mbar (29.0 inHg) – a bulletin issued by the Weather Bureau an hour later indicated that the storm had "probably reached hurricane intensity". According to post-season analysis, Carla reached hurricane status at that time. Shortly after becoming a hurricane on September 6, Carla curved northward in the northwestern Caribbean Sea. At 1200 UTC on September 7, the storm intensified into a Category 2 hurricane while located east-northeast of Cozumel, Quintana Roo, Mexico (actual use of the Saffir-Simpson Hurricane Wind Scale, which was developed in 1971, was not in effect). Shortly thereafter, Carla crossed the Yucatán Channel and entered the Gulf of Mexico. A strong high pressure area forced Carla to resume its original northwesterly course. Early on September 8, the storm strengthened into a Category 3 hurricane while located just north of the Yucatán Peninsula. Thus, Carla was the third major hurricane of the season. Carla was upgraded to a Category 4 hurricane early on September 10, while approaching the Gulf Coast of the United States. At 0000 UTC on September 11, Carla strengthened into a Category 5 hurricane while located in the northwestern Gulf of Mexico. Six hours later, the storm reached its maximum sustained wind speed of 175 mph (280 km/h). A 2018 reanalysis concluded that Carla did not reach Category 5 intensity, and in fact only had maximum sustained winds of 145 mph (230 km/h), but this has not yet been officially incorporated into HURDAT. Although it weakened back to a Category 4 hurricane late on September 11, Carla reached its minimum barometric pressure of 931 mbar (27.5 inHg). Later that day, the storm struck Matagorda Island, Texas (seven miles south of Port O'Connor) with winds of 145 mph (230 km/h). Carla rapidly weakened inland, and degenerated to a Category 2 hurricane on September 12, while passing just east of Port Lavaca. Six hours later, the storm was downgraded to a Category 1 hurricane near Shiner, shortly before being downgraded to a tropical storm between Taylor and Coupland. Beginning late on September 12, the storm curved just east of due north. After reaching Oklahoma early on September 13, Carla transitioned into an extratropical cyclone while located over rural Johnston County. The extratropical remnants of Carla moved rapidly northeastward and brought heavy rainfall to some areas of the Great Plains and Midwestern United States. By September 14, it entered Canada near Sault Ste. Marie, Ontario. It then continued swiftly northeastward across Ontario, Quebec, and Labrador, before the remnants dissipated over the Labrador Sea on September 17. Occurring a year after Hurricane Donna, officials in the Florida Keys took precautions to brace for potential impact from the storm. The United States Navy flew their planes out of Key West, while Coast Guardsmen evacuated Alligator Reef Light, American Shoal Light, and Sombrero Key Light. Ships docked at Key West sailed out to sea to ride out the squalls. On the morning of September 7, a hurricane watch was issued from the entire coast of Louisiana eastward to Apalachicola, Florida. On September 8, a hurricane watch was issued along the southwest coast of the state from Vermilion Bay westward. It was later extended westward to include the entire coast of Texas, and eastward to Apalachicola, Florida. A portion of the hurricane watch from Aransas Pass, Texas to Grand Isle, Louisiana was upgraded to a hurricane warning at 1600 UTC on September 9. An estimated 500,000 people fled the coasts of Texas and Louisiana, making it the largest evacuation in the history of the United States, at the time. Further, at least half of those people were from Texas. In small towns along the coast of Texas, 90–100% of their populations evacuated, while 20% of people left the larger cities. Many in Galveston stayed due to protection from the Galveston Seawall. Carla spawned the largest hurricane-related tornado outbreak on record at the time, when 26 tornadoes touched down within its circulation. However, it was overwhelmingly surpassed by Hurricane Beulah in 1967, which spawned at least 115 tornadoes. Throughout its path, 43 fatalities and about $325.74 million in damage were attributed to Carla. 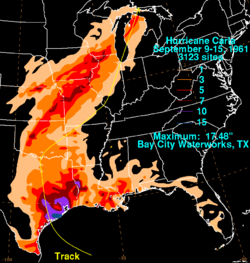 Most of the impact occurred in Texas, where the storm made landfall as a large and strong Category 4 hurricane. Abnormally high tides and storm surge was reported along the coast of Texas, reaching at least 10 feet (3.0 m) above mean sea level at many coastal areas between Sabine Pass and Port Aransas. The highest tide reported was 18.5 feet (5.6 m) at Port Lavaca, with large wave heights including 12.6 feet (3.8 m) in Matagorda, 10.9 feet (3.3 m) in Port Aransas, 10.8 feet (3.3 m) in Freeport, 10.1 feet (3.1 m) in Texas City, and 10 feet (3.0 m) in Galveston and Sabine. Because the storm was a Category 4 hurricane at landfall, Carla produced strong winds, especially near its path. The strongest sustained winds include 115 mph (185 km/h) in Matagorda, 110 mph (180 km/h) in Victoria, and 88 mph (142 km/h). Additionally, the highest wind gust observations include 175 mph (282 km/h) in Port Lavaca, 160 mph (260 km/h) in Matagorda, and 150 mph (240 km/h) in Aransas Pass, Austwell, Edna, Port Aransas, and Victoria. Carla produced heavy rainfall in Texas, peaking at 17.48 inches (444 mm) in Bay City. Other significant precipitation totals include 16.49 inches (419 mm) at Scholes International Airport at Galveston, 14.94 inches (379 mm) in Downtown Galveston, 13.05 inches (331 mm) in Wharton, 12.55 inches (319 mm) in Liberty, 12.47 inches (317 mm) in Dickinson, 11.81 inches (300 mm) in Flatonia, 10.59 inches (269 mm) in Columbus, 8.75 inches (222 mm) in Hallettsville, and 8.9 inches (230 mm) in Smithville. The most significant damage to property occurred between Port Arthur and Corpus Christi. 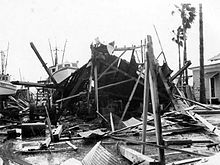 Port O'Connor, lying nearest to the location of Carla's landfall, was virtually destroyed. In Victoria, the highest sustained wind speed was 110 mph (180 km/h), while gusts reached 150 mph (240 km/h). About 4,260 homes were damaged, with around 500 severely damaged or destroyed. 43 businesses and 26 public buildings were also significantly impacted. Damage in the city of Victoria reached $10 million. Of the 26 tornadoes spawned by Carla, eight of them in Texas caused significant impact. A tornado near Bay City destroyed two radio towers and damaged several buildings. Near Jacksonville, a tornado injured three people, caused the destruction of one house and impacted 3 others, resulting in $25,000 in damage. Twenty-two people were injured, 18 homes and 6 commercial buildings were destroyed, and 40 additional homes were damaged in a tornado in Channelview, located near Houston; losses reached $200,000. 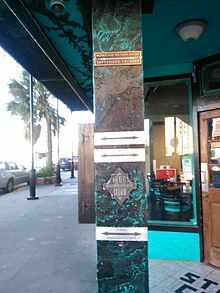 In the early morning hours of September 13, an F4 tornado moved across Galveston Island along a 15-mile (24-kilometer) long, 230-yard-wide path (it crossed into Galveston Bay as well), severely damaging 200 buildings, of which at least 60 were destroyed, and causing eight deaths and 55 injuries. A few hours later, another twister in the area resulted in the destruction of six houses and extensive lesser damage. In Hardin, a tornado damaged six homes. Several structures sustained impact during a tornado in Fulbright. The final twister occurred during the late afternoon hours in Latex. It caused two injuries, and resulted in $5,000 in losses, after damaging two houses and three garages. Then little-known newsman Dan Rather reported live from the second floor of a building in Texas City during the storm, an act that would be imitated by later reporters. This marked the first live television broadcast of a hurricane. Rather also alerted the public of the size of Carla in a way that "literally changed the way the world sees hurricanes", according to a fellow reporter. Broadcasting live at the Weather Bureau Office in Galveston, Rather asked a meteorologist to draw an outline of the Gulf of Mexico on a transparent sheet of plastic. He then held the map over the black and white radar screen, which put the size of Carla into perspective, saying that Carla was the size of the Gulf of Mexico. CBS was so impressed with Rather's work that he was offered the position of correspondent. Throughout Texas, Carla destroyed 1,915 homes, 568 farm buildings, and 415 other buildings. Additionally, 50,723 homes, 5,620 farm buildings, and 10,487 other buildings suffered damage. There were 460 injuries according to the American Red Cross, though the Monthly Weather Review listed a slightly higher number, 465. The storm caused 34 fatalities in Texas. Causes of death include 20 people drowning, eight from tornadoes, four electrocutions, and one heart attack. Overall, damage in the state was "conservatively" estimated at $300 million. A breakdown of damage indicates $200 million incurred to property and $100 million to crops, mostly from unharvested rice and lesser impact to cotton and citrus. In southeastern Louisiana, abnormally high tides lashed the coast, though no beach erosion was reported. Rainfall was heavy, peaking at 13.9 inches (350 mm) in Many. Other observed precipitation totals include 5.6 inches (140 mm) in Baton Rouge, 5.57 inches (141 mm) in Morgan City, 4.25 inches (108 mm) in Shreveport, 3.16 inches (80 mm) in New Orleans, 2.25 inches (57 mm) in Lafayette, 2.19 inches (56 mm) in Alexandria, 2.1 inches (53 mm) in Jonesville and West Monroe, and 1.37 inches (35 mm) in Lake Charles. In the western portions of Louisiana, sustained winds peaked at 44 mph (71 km/h) and gusts reached 55 mph (89 km/h). Only minor damage occurred, limited to roofs, glass, and downed tree limbs. Winds caused a local river to reach 1 foot (0.30 m) above flood stage. The 11 tornadoes spawned by Carla in Louisiana destroyed 140 homes and 11 farm and other buildings, while causing major damage to 231 additional homes and 11 farm and other buildings. Additionally, 748 homes and 75 farm and other buildings suffered minor to moderate damage. Six fatalities and 199 injuries occurred, mostly related to the tornadoes. Damage in Louisiana totaled to about $25 million. A breakdown of losses include $6 million to agriculture, $5 million to buildings, $4 million to boats and beach property, $3 million to roads and bridges, $5 million to oil platforms just offshore, and $2 million in miscellaneous damage. Carla and its remnants brought heavy rainfall and strong winds to portions of Oklahoma. About 2–8 inches (51–203 mm) of rain fell in Grant, Tillman, Washita Counties. Heavier amounts of at least 5 inches (130 mm) fell in Atoka and Pushmataha County. Precipitation in the state peaked at 7.68 inches (195 mm) in Kingfisher. More than 140 city blocks were flooded with up to 6 feet (1.8 m) in residential areas of Kingfisher and up to 3 feet (0.91 m) in business areas. 225 homes and buildings in the city suffered water damaged. Throughout the state, damage in other areas included 90 homes and buildings in Tulsa, 50 homes each in El Reno and Oklahoma City, and 10 homes in Pawnee. Additionally, water inundation washed out several bridges and highways in northeastern parts of the state, leaving roads impassable. Sustained winds between 30 and 55 mph (48 and 89 km/h) and gusts up to 70 mph (110 km/h) were recorded in Oklahoma. Winds injured two people due to airborne debris. Winds and rain combined severely disrupted electrical and telephone services and caused $670,000 in damage, with $600,000 to property and $70,000 to crops. The storm dropped precipitation amounts of 7 inches (180 mm) throughout northwestern Illinois, with a peak of 8.18 inches (208 mm) in Mount Carroll. 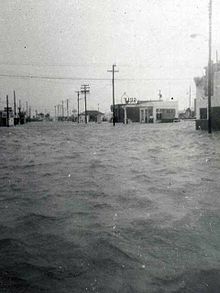 Thus, Carla is the second-wettest tropical cyclone in Illinois, behind only Hurricane Audrey in 1957. Additionally, up to 6.29 inches (160 mm) fell in 24 hours. Severe local flooding occurred, especially in the northern portions of the state. Heavy property and agricultural damage occurred. Streets and basements were reported to have flooded, while bridge approaches and a few small bridges were washed out. Precipitation of 2.5–3.5 inches (64–89 mm) in Chicago flooded about 60 viaducts and 1,000 basements. After the Chicago River rose 5 feet (1.5 m), the lock gate to Lake Michigan was opened to release excess water. However, the abrupt onrush of water resulted in about $75,000 in damage to boats at Wilmette Harbor. Winds in Key West reached 30 mph (48 km/h), while much of Florida reported rainfall from the outer bands of Carla. In Kansas, 4 to 7 inches (100 to 180 mm) of rain in only 6 hours caused flash flooding. With a peak amount of 8.52 inches (216 mm) in Haddam, Carla was the rainiest tropical cyclone in Kansas, until being surpassed by Hurricane Paine in 1986 and Tropical Storm Frances in 1998. Severe crop damage occurred, especially in areas of Chautauqua and Shawnee Counties and to the south of the Kansas River. Many highways were left impassable due to water inundation. A family of 4 drowned after their car was swept off a road near Waverly. A fifth fatality occurred after a car with one occupant was swept into a tributary of the Marmaton River near Fort Scott. The storm persistently produced winds of 35 to 50 mph (56 to 80 km/h), causing further agricultural damage. In Nebraska, rainfall peaked at 5.68 inches (144 mm) in Hubbrell, making Carla the rainiest tropical cyclone in the state. Heavy precipitation also fell in Missouri, especially in Brookfield, Lee's Summit, and Pleasant Hill. The maximum rainfall total in Missouri was 9.34 inches (237 mm) in Concordia. One fatality was reported in Missouri, though the cause of death is unknown. Rainfall in Iowa peaked at 9.03 inches (229 mm) near Chariton, making Carla the rainiest tropical cyclone in the state. Up to 8 inches (200 mm) of rain fell in a 12-hour period in the Lower Peninsula of Michigan, mostly between Cheboygan and Grand Rapids. However, the Weather Prediction Center indicated precipitation amounts of 6.07 inches (154 mm) in Boyne Falls. Regardless, Carla is the wettest tropical cyclone in the history of Michigan. Despite, the rainfall, flooding in Michigan was relatively minimal, limited to an washed out dam in Traverse City. Precipitation in Wisconsin reached 7.58 inches (193 mm) in Brodhead, causing Carla to rank as the wettest tropical cyclone in the state. Precipitation peaks in other states include 4.44 inches (113 mm) in Alabama, 5.48 inches (139 mm) in Arkansas, 6.37 inches (162 mm) in Mississippi, and 3.6 inches (91 mm) in Indiana. In Cuba, broadcasts reported severe flooding near Pinar del Río, and in Los Colomas and Punta de Cartas. Offshore Honduras on Swan Island, a rainfall amount of 3.89 inches (99 mm) was reported along with wind gusts up to 60 mph (95 km/h). The remnants of Carla brought tropical storm force winds to some areas of Canada. In Ontario, gusty winds caused power outages in the Clarkson–Port Credit area. Electrical services were are disrupted in New Brunswick, due to winds up to 80 mph (130 km/h) in Saint John. Winds of 57 mph (92 km/h) lashed Halifax in Nova Scotia, thus the Halifax Public Gardens closed for threat of falling trees and branches. Shortly after the storm, Vice President Lyndon B. Johnson, a lifelong resident of Texas, toured the devastation in the state and met with officials from 18 different counties, remarking that "as always, Texans are arising to a challenge... We have suffered hurricane, tornado, and floods, but we in Texas are a bold and brave people." After his report to President John F. Kennedy and Congress, $55 million was approved in aid for Texas, though Kennedy later requested an additional $65 million. President Kennedy issued a disaster declaration for Texas, allowing all jurisdictions in the state to apply for public assistance. The president also declared 6 parishes in Louisiana a disaster area. Helicopters deployed 88 United States Marines to Galveston to patrol devastated areas. A United States Navy task force composed of medical and construction work teams was also sent to the area. Members of the United States National Guard assisted refugees in returning to their homes and worked to prevent looting. Owing the hurricane's intensity and destruction, the name Carla was retired and will never again be used for an Atlantic hurricane. It was replaced by Carol in the 1965 season. ^ Mark Chambers (2008). The Hurricane Severity Index – A New Method of Classifying the Destructive Potential of Tropical Cyclones (PDF). ImpactWeather (Report). Houston, Texas: Rice University. p. 20. Retrieved January 13, 2013. ^ a b ECH (September 21, 1961). Carla Preliminary Report (GIF). Weather Bureau (Report). Silver Springs, Maryland: National Hurricane Center. p. 12. Retrieved January 11, 2013. ^ a b c d e "Atlantic hurricane best track (HURDAT version 2)". Hurricane Research Division (Database). National Hurricane Center. May 1, 2018. Retrieved April 23, 2019. ^ a b ECH (September 21, 1961). Carla Preliminary Report (GIF). Weather Bureau (Report). Silver Springs, Maryland: National Hurricane Center. p. 13. Retrieved January 11, 2013. ^ ECH (September 21, 1961). Carla Preliminary Report (GIF). Weather Bureau (Report). Silver Springs, Maryland: National Hurricane Center. p. 14. Retrieved January 11, 2013. ^ Conner (September 7, 1961). Hurricane Advisory Number 15 Carla (GIF). Weather Bureau Office New Orleans, Louisiana (Report). National Hurricane Center. Retrieved January 11, 2013. ^ Weather Bureau Office Statement (GIF). Weather Bureau Office Lake Charles, Louisiana (Report). National Hurricane Center. September 8, 1961. Retrieved January 11, 2013. ^ "Hurricane Advisory Number 16 Carla" (GIF). Weather Bureau Office New Orleans, Louisiana. National Hurricane Center. September 8, 1961. Retrieved January 11, 2013. ^ Taylor and Carson (September 9, 1961). Tide Statement Upper Texas Coast (GIF). Weather Bureau Office Galveston, Texas (Report). National Hurricane Center. Retrieved January 11, 2013. ^ Stephen Lichtblau (September 15, 1961). Preliminary Report of Hurricane Carla in the Gulf of Mexico: September 7–13, 1961 (GIF). Weather Bureau (Report). Silver Springs, Maryland: National Hurricane Center. p. 3. Retrieved January 11, 2013. ^ a b Robert Orton (September 16, 1961). Hurricane Carla in Texas September 8 to 13th, 1961 (GIF). Weather Bureau Office Galveston, Texas (Report). National Hurricane Center. p. 1. Retrieved January 11, 2013. ^ a b Robert Orton (July 1970). Tornadoes Associated With Hurricane Beulah on September 19-23, 1967 (PDF) (Report). Austin, Texas: National Oceanic and Atmospheric Administration. p. 541. Retrieved January 8, 2013. ^ a b c d e f g h Luther Hodges (1961). Storm Data And Unusual Weather Phenomena: September 1961 (PDF). United States Department of Commerce (Report). Asheville, North Carolina: National Climatic Data Center. pp. 99–101, 103. Retrieved January 10, 2013. ^ a b c d Luther Hodges. Storm Data and Unusual Weather Phenomena: December 1961 (PDF). United States Department of Commerce (Report). National Climatic Data Center. p. 120. Retrieved January 12, 2013. ^ a b c Hurricane Carla: September 4–14, 1961 (A Preliminary Report). Weather Bureau (Report). National Hurricane Center. September 18, 1961. p. 2. Retrieved January 10, 2013. ^ Jones (September 14, 1961). Preliminary Report on Carla (GIF). Weather Bureau Office Victoria, Texas (Report). National Hurricane Center. Retrieved January 11, 2013. ^ Megan Garber (October 29, 2012). "Dan Rather Showed the First Radar Image of a Hurricane on TV". The Atlantic. Retrieved January 11, 2013. ^ Robert Orton (September 18, 1961). List of known dead in Texas from Hurricane Carla as of September 18th (GIF). Weather Bureau Office Galveston, Texas (Report). National Hurricane Center. Retrieved January 11, 2013. ^ Sanders (1961). MKCC .60 2250Z (GIF). Weather Bureau Office New Orleans, Louisiana (Report). National Hurricane Center. Retrieved January 10, 2013. ^ Worrell (September 12, 1961). Report on Hurricane Carla for Lake Charles (GIF). Weather Bureau Office Lake Charles, Louisiana (Report). National Hurricane Center. Retrieved January 11, 2013. ^ a b c d e f g h i Tropical Cyclone Rainfall for the Midwest (HTML) (Report). College Park, Maryland: Weather Prediction Center. 2012. Retrieved January 12, 2013. ^ "Hurricane Whips Cuba; Winds Batter Key West". The Miami News. September 7, 1961. p. 72. Retrieved January 8, 2013. ^ Tropical Cyclone Rainfall for the Gulf Coast (HTML) (Report). College Park, Maryland: Weather Prediction Center. 2012. Retrieved January 12, 2013. ^ 1961-Carla (HTML) (Report). Fredericton, New Brunswick: Environment Canada. November 5, 2009. Retrieved January 11, 2013. ^ "Johnson Reports on Hurricane Damage". The Bonham Daily Favorite. Washington, D.C. United Press International. September 19, 1961. p. 1. Retrieved January 11, 2013. ^ a b "JFK Asks Hurricane Aid Money". The Miami News. Associated Press. September 21, 1961. p. 22. Retrieved January 11, 2013. ^ Designated Counties: Texas Hurricane Carla (HTML) (Report). Washington, D.C.: Federal Emergency Management Agency. Retrieved January 10, 2013. ^ "Rescue Teams Move In To Clean Storm Area". Evening Independent. Galveston, Texas. Associated Press. September 17, 1961. p. 2. Retrieved January 11, 2013. ^ Retired Hurricane Names Since 1954 (HTML). National Hurricane Center (Report). Miami, Florida: National Oceanic and Atmospheric Administration. April 13, 2012. Retrieved January 12, 2013.